If you are looking for a festive graduation treat that needs no baking, these super simple candy graduation cap pops are perfect for your next graduation celebration! They only need a few supplies and go together quickly but will be an edible decoration at your party. 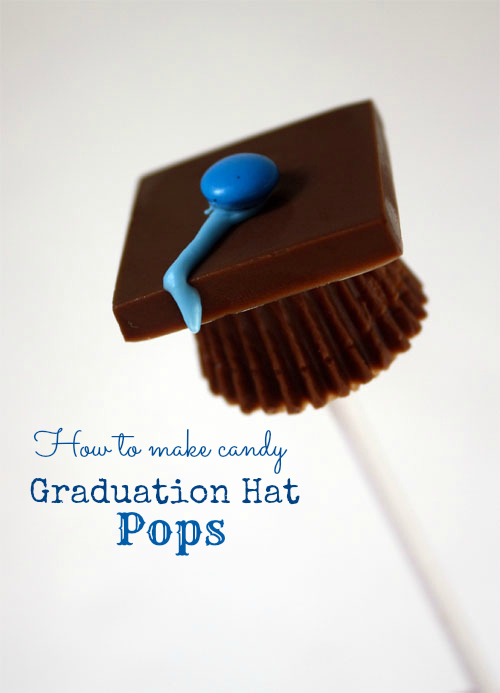 Display the graduation hats on a cake pop stand or they can also be pushed into floral foam. Slowly melt candy coating at 15 second intervals in the microwave, stirring after each 15 seconds. About 40 candy disks will fill the mold. Fill mold with candy coating and tap mold to release bubbles. Place mold in freezer for 5-10 minutes until chocolate is completely cooled. Chocolate squares should fall easily out of the mold. Dip sucker stick into candy coating and stick into the peanut butter cup. Allow to harden. Melt candy writers according to package directions. Starting in the center of the chocolate square draw a line to the edge making a tassel. Place a mini m&m in the center on top. 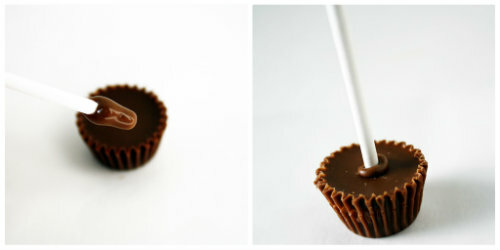 Attach the chocolate square to the peanut butter cup with a dab of melted candy coating. 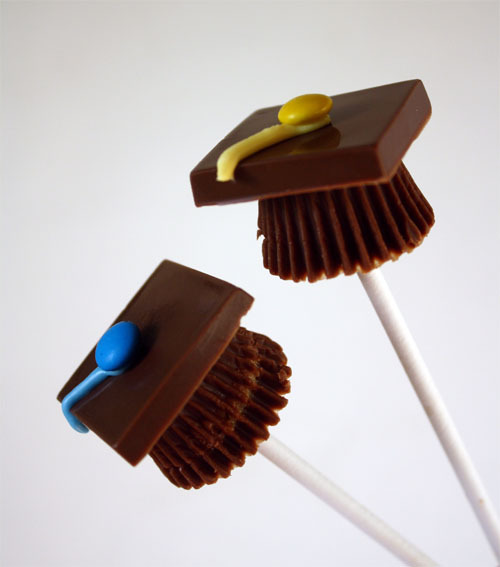 Allow candy coating to set and you have the perfect candy graduation cap! If you need a graduation card you might like these free printable cards for grads. The best part is they are a gift and card all in one. 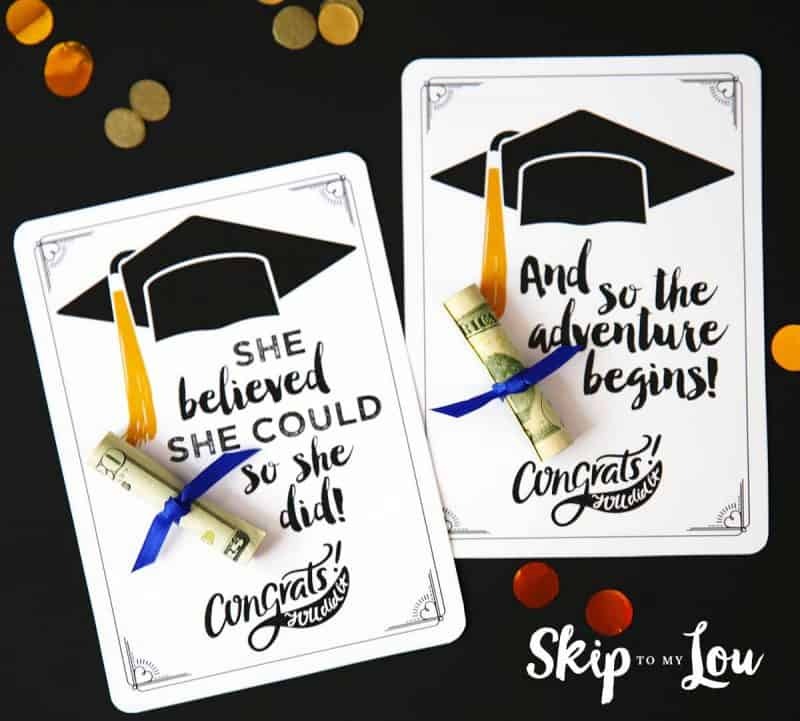 Roll up a bill or two and make a cute little money diploma and attach to the card. Here are two Graduation Cards with inspirational quotes for you to download. 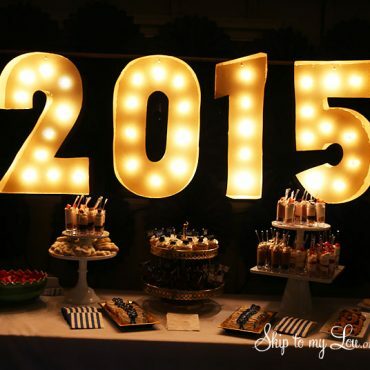 From Graduation Cap cookies to a DIY lighted marquee sign you can celebrate your graduate in style! How about using Hershey candy bar in the big size for the squares?the big bars are thicker!!!! One idea for displaying the graduation cap candy pops is to cover a Styrofoam square with tissue paper of your school's colors then the sticks would easily go in and stand up. Jan I agree with you I think a rolo would be a great substitute. This is such a neat idea, we are making them for my daughter's graduation party in June. 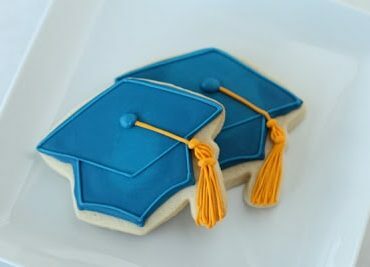 I would love to make these for my son's preschool graduation ceremony in a couple of weeks. BUT we aren't allowed to bring anything with peanuts because some kids are allergic..Any ideas of what else you could use besides the peanut butter cups? Love the idea and thanks for sharing! 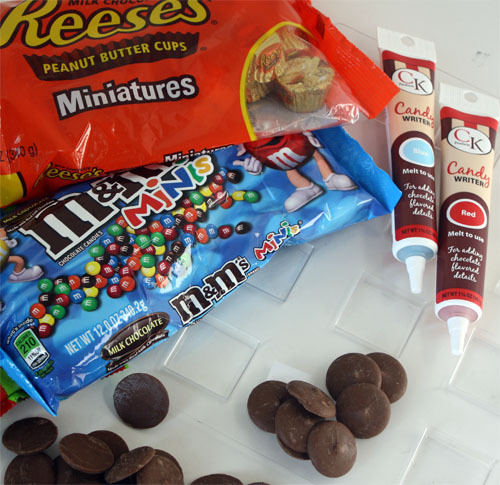 Use hershey's kisses in place of the reese's. They work great! super cute! Do you recall what size the square molds were? Liz the mold is about 1 inch square. You can purchase from Sweet Baking Supply (My shop). I made these a few years ago. I used Ghiradelli chocolate squares for my tops. Also, I would recommend freezing your Reese's Cups for a little while. The chocolate is less likely to stick to the wrapper that way. You can also use Airheads Extremes Sour belts. 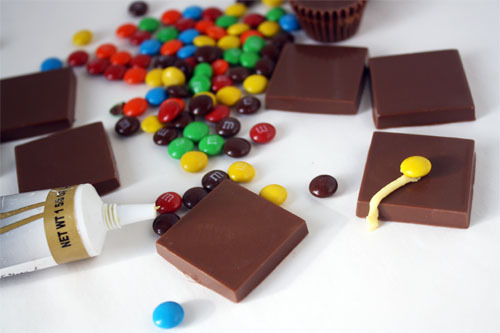 They are striped and just cut apart the colors I wanted and used the melted chocolate to attach them. That way I didn't have to mix up different colors of frosting. Anyway you make them, they are cute! The party I made them for loved them! That is a great idea Rachel to freeze the Reese's Cups to easily remove the wrappers! These are so cute. I used Herseys candy bars. Use two squares per hat and turn upside down worked great. I went back and reread the directions and found the source for the square molds. I ordered on Sat and they arrived today (TU) When you consider Sun and Memorial Day in between, I'd say the Sweets has very good service. Wilton evidently doesn't make the square candy molds. Who does? Where can I find them? There is a link in the post for the molds. 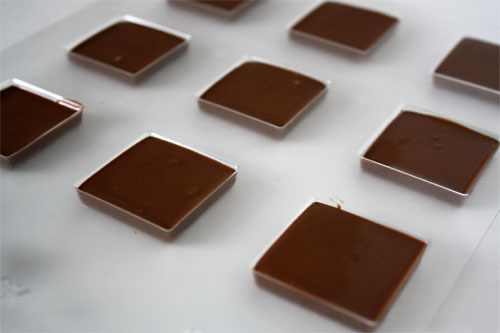 Here is a 1 1/4" square chocolate mold perfect for making the top of the graduation hats. This is an amazing idea. I graduated from college last weekend. I am having my party at the end of June and I will be making these... I am also making them for my mom. She works in a special education classroom and their graduating party is June 8. Just wondering though... Is there another kind of chocolate that can be used instead of the mold? Approximately how many candy sticks does this make??? I think one pound of the candy coating would make about 2 dozen squares. I made these for my oldest sons grad party, but used "Keebler" fudge grahams instead of the candy molds. Only used writers for the tassle and top. Simply heated a cookie sheet in the oven to melt the chocalate on the peanut butter to put the cookie on. I've made these without the stick, but yours are sooo much cuter! I'd love for you to add it on my link party at: http://printabelle.com/?p=3188 Thanks! for an easy way to serve, just skip the sucker stick and just set onto a tray. If you are keen on keeping the stick, just use styrofoam blocks or the foam that live plants are arranged with, just cover with foil first. These are ADORABLE!!!!!! What a great idea!!!! This is a wonderful idea. Perfect for graduation centerpieces! Genius! These are so much fun! I love this. I am now on the look out for something to replace the mini peanut buttercups with as there is a peanut allergy in this house. As a non-baker, I LOVE this idea! Thank you!! Like Melissa, I would also like to hear ideas on how to hold them before serving. Thoughts? OMG so cute!!!! Definitely doing these for all 3 of my cousins' graduation party!! Thanks! So cute! These would be perfect for my son's PreK graduation! What would you use to hold them to serve? This is so cute and so easy!! Wish I had someone graduating to make it for. Thanks for sharing your awesome idea! !